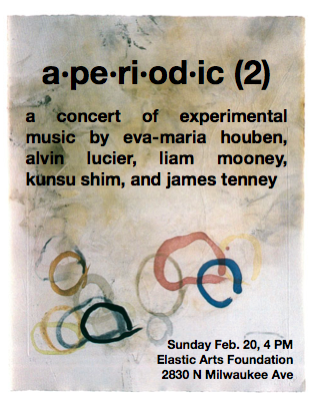 This Sunday afternoon at 4 PM at Elastic, the relatively young Chicago new-music collective Aperiodic will present its second concert: a forward-looking program marked by bold post-Cage experimentation. The loose-limbed ensemble, formed by local composers Nomi Epstein and Lee Weisert, includes members from overlapping communities of classical, experimental, and improvising musicians. The composers represented on this concert series are interested in themes of indeterminacy, silence, and pushing the boundaries conceptually of how music should work. This is reflected in the notation of many of the scores, some of which are simply prose instructions outlining a set of sonic possibilities. All of the pieces have a level of indeterminacy, but a level of controlled improvisation and most importantly and divergent from other improvisatory music, a score (they are notated pieces). Indeterminacy could apply to a variety of aspects of the music, such as what instruments are involved, duration, pitch choice, rhythm, and so on. In that way this is improvisational music, but of a very different type than what we typically think of when we hear that word (in reference to jazz or free music, for example). In rehearsal and performance, everyone in the group is constantly making choices based on the limitations laid out by the composer. Every performance is unique, and reflective of this interactive process. What initially caught my eye about this weekend's concert were pieces by Kunsu Shim and Eva-Maria Houben, both of whom are associated with the Wandelweiser group, a Eurocentric composers' collective that fits Epstein's description perfectly. (Wandelweiser member Michael Pisaro has written an excellent essay about the group's concerns.) Over the past couple of years I've been increasingly drawn to Pisaro's music; the group's most prominent American member, he's cochair of the Composition and Experimental Sound Practices department at CalArts. For most of the 90s he was a professor at Northwestern University, during which time he got involved with Wandelweiser, and by the middle of that decade Chicago was the unofficial center of the group's activities in the U.S. I recently searched the Reader's archived concert listings and found performances by key Wandelweiser figures like Shim, Gerhard Stabler, and Pisaro, and in an e-mail Pisaro tells me that Manfred Werder, Antoine Beuger, and Jürg Frey all spent time in Chicago. The Reader's Deanna Isaacs even wrote a terrific story about Pisaro's piece Pi in 1999. In addition to the works by Shim and Houben, Sunday's program will include "In Memoriam Jon Higgins," a gripping piece for clarinet and oscillator by Alvin Lucier, and "Swell Piece #2" by James Tenney—an acoustic long-tone work written for Pauline Oliveros that uses acoustic effects to sound almost electronic.